A child’s growing awareness of the mortality of people and pets prompts a natural curiosity about what happens after death. 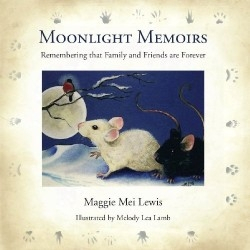 In this picture book, young author Maggie Mei Lewis shares a comforting view of an afterlife where the living are loved and watched over by the people and animals who have left life before them. When two mice take a walk on a snowy winter night, they are surprised by an old silver mouse who takes them on a journey “to learn a great lesson.” They follow the silver mouse to a mysterious clearing filled with a variety of woodland creatures who “emerge out of nowhere” and “glow with a soft gentle light.” These forest creatures share a vision of life where the dead are ever-present, acting as guardian angels for their loved ones. The message is a soothing one that will bring comfort to children who are struggling with a loss and will satisfy the imaginations of those who are simply wondering what’s next. The rhyming format of the text sometimes leads to awkward sentence construction like, “In the stars the story of life is kept,” and this has the potential to distance young readers. Melody Lea Lamb’s lifelike acrylic paintings of mice, rabbits, cats, and other natural creatures are centered on each page, surrounded by short bursts of text and faint images of animal tracks. This creative layout gives the book a cozy feel, and invites the reader to keep turning pages.